CCE Project Works for 6th/ 7th/ 8th/ 9th/ 10th Class Subject wise FA 3 (Formative 3) for AP/ Telangana : AP TS FA 1 2 3 4 SA 1 2 3 CCE Model Projects for All Subjects Project Works for FA 1 FA 2 FA 3 FA 4 for 6th 7th 8th 9th 10th Class Model Projects and Project work Steps Download. SSC CCE Model Question Papers : Subject wise Model Project Works 1st, 2nd, 3rd, 4th, 5th, 6th, 7th, 8th,9th and 10th Classes. Subject Project works Languages – Telugu, Hindi, English and Non Languages – Mathematics, General Science, Physical Science ( PS ), Biology (NS ) Project Woks. AP and TS Formative Question Papers, Telangana CCE Model Project Works Class wise and Subjects wise for AP. 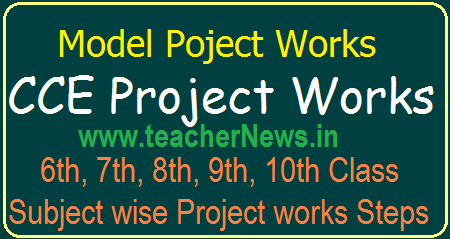 Download Formative Assessment Project Works, Summative Assessment Project Works VI to X.
CCE Project Works for 6th/ 7th/ 8th/ 9th/ 10th Class Subject wise FA 3 (Formative 3) for AP/ Telangana. CCE Projects & Assignments for 6th to 10th classes Students.